450mm W20 x 1/2UNF S/S pigtail for ELECTRIC Outlet Tanks. - GAS IT Leisure Gas Bottles, Gas Cylincers and Gas Tanks - Catering, Motorhome, Campervan, Caravan, Farrier and Road Repair Refillable Gas Solutions. W20 x Copper Standpipe with 1/2 UNF flare nut S/S Hose Assembly 450mm long for our GAS IT ELECTRIC outlet tank range. This pigtail has been designed to work directly with the electric solenoids fitted in the GAS IT ELECTRIC tank range. The 1/2 UNF end will screw directly onto the electric shut off outlet solenoid and the other end is the standard W20 designed to go directly to the gas regulator where a standard W20 pigtail goes. They are a flexible alternative to our copper pipe version pigtails for the same GAS IT ELECTRIC outlet tanks. They come in 3 different lengths and all are listed on the GAS IT webshop. 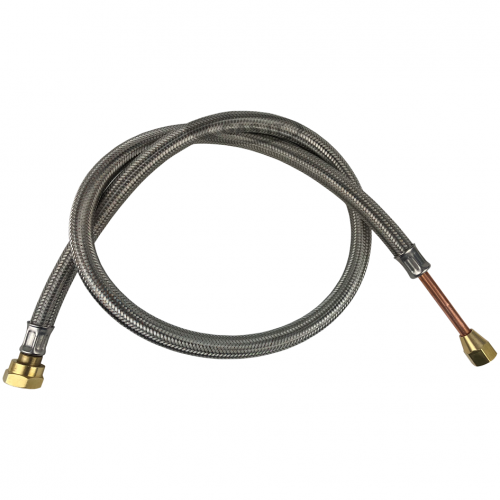 These pigtail hoses will not fit the standard manual taps gas tanks or gas bottles outlet - they are specifically for ELECTRIC Outlet Tanks only.